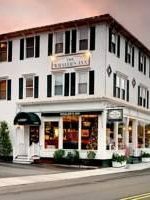 At one time, the Eastern Seaboard was full of Grand Victorian hotels stretching from South Carolina to Maine, each striving to outdo the others in elegance and luxury as they catered to a newly wealthy American upper class. At the time Ocean House was built in 1868, there were at least eight other hotels of its kind in the resort community of Watch Hill, a rocky projection with sweeping views of the Atlantic that juts out from the southwest tail of Rhode Island. Over time, however, the hotels each succumbed to fire or neglect, and were torn down one by one to make room for more modern mansions. Only Ocean House survived, catering to generations of beachgoers, even as it gradually crumbled into romantic decay. In 2003, the hotel was closed for good, and plans were made to tear it down as well. That’s when the townspeople rallied around the property, determined to save it. The opportunity came with the purchase by New York mutual fund manager and Watch Hill summer resident Charles M. Royce, who determined that the hotel was past renovating — but that it could be reconstructed. Over the course of five years, builders tore the hotel down to its foundations, but saved more than 5,000 items — doors, windows, railings, the mahogany front desk and each stone from the giant 1895 fireplace in the lobby — along the way. They incorporated them as they rebuilt the hotel as close to the original as possible, even down to experimenting with eight shades of yellow paint until they were able to satisfactorily recreate the famous butter-cream facade that signaled to generations of guests that their seaside vacation had arrived. Even while the exterior and common areas remain virtually unchanged from 150 years ago, the interior of the hotel has been completely updated to fit the modern rather than the Victorian idea of luxury. The number of rooms have been dramatically reduced to just 49, including several spacious suites, and a state-of-the-art fitness center, saltwater lap pool and 12,000-square foot spa have been added in an unobtrusive new wing. 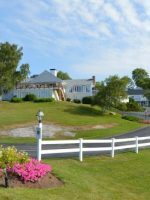 Despite such upscale amenities, however, the hotel is just as welcoming to families as it has been for decades, complete with family-friendly activities and dining choices, access to a private beach, and the delightful town of Watch Hill, complete with its ice cream shop and carousel just a few minutes walk away. The hotel provides small touches to make kids feel welcome, with child-sized robes and children’s bath products, and complimentary use of strollers, toys and Pack ‘N Plays on the beach. Parents should be aware, however, that in some ways the hotel does carry on the high Victorian traditions its known for more than a century. High tea is served on the verandah in the afternoon, guests bring their sporting whites to play croquet on the lawn, jackets are suggested for the restaurant at night. It’s hard not to get the feeling that the hotel underestimated the popularity of the property with families and is now struggling to catch up. 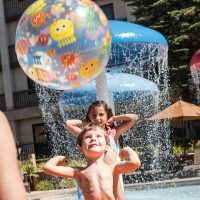 The staff, which seems drawn mostly from local young teens and 20-somethings, sometimes struggles with the balance of making families feel welcome while still maintaining the formal atmosphere of the resort. It goes without saying that small children should get a speech about “best behavior” before arrival, no matter how adept staff are at dealing with exuberant younger guests. Ocean House spared no expense on its rooms during the reconstruction of the property, and it's easy to think about flopping down on 400-thread-count linens and goose down pillows and forget about going out to the beach altogether. The decor is intentionally understated, with white, beige and olive color scheme and beachy art on the walls. That's all the better, of course, to show off the real scenery of the ocean sparkling through the windows. Many rooms additionally feature French doors leading out onto patios where you can sit and admire the waves and the breeze. Cribs are provided free of charge and kids under 12 stay free with their parents. 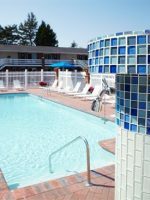 The rooms themselves are tricked out with all the technology you need, including 42-inch flat-screen TV, Wi-Fi, DVD player, mini-fridge and iPod dock, and feature a marble bathroom with soaker tub. Several larger suites include even more luxurious living space, with a kitchenette and a dining room table and additional bedrooms for large families or families with older kids keen on privacy. 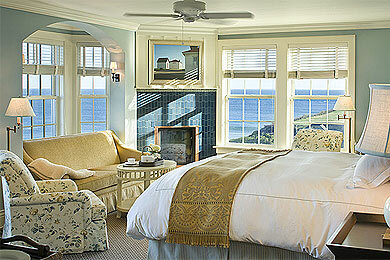 The suites also include even more spacious outdoor patios, with some offering a panoramic 180-degree view of the ocean. This is the place to visit while in the Westerly area.... pricey but there is always drinks out on the veranda! A good place to stop in with friends visiting, and check out the ocean views. Bring a shawl ladies, it gets pretty breezy. Our family has been coming to the Ocean House since the resort opened around 10 years ago, mainly during the summer. We decided to visit last weekend (off season) and had an absolutely incredible experience. The location (right on the beach) and facilities are fantastic. The service was even better from the second we drove in to when we departed. We had to leave early and the staff had our car waiting for us with a wonderful "to go" breakfast as a special request. We scheduled 4 half-day spa treatments on short notice and they made it all work even on a really busy day for the spa. The tasting menu at their main restaurant was a special experience as well. We have stayed at the nicest luxury hotels throughout the world and I have to say, the Ocean House is right at the top of the list because of its location, amenities and service. You will not find a better resort on the East Coast. One of the best features of Ocean House is the stunning presence of the ocean itself. 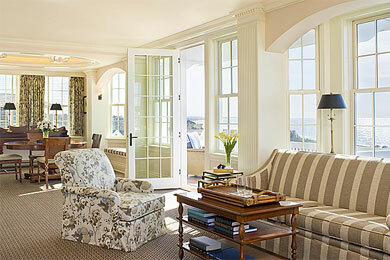 Many rooms offer extravagant views of Block Island Sound from the hotel's vantage point on the bluffs overlooking the sea. Even better, it's only a short walk down a path to access the ocean on a 650-foot soft-sand beach that is exclusively reserved for guests, and tricked-out with all that you need to enjoy an afternoon or day at the beach. The hotel rents out cabanas -- or you can just take advantage of umbrellas and lounge chaises set up on the sand with drink service from the nearby "dune cottage"-- a teakwood gingerbread cottage that serves up hamburgers, paninis, wraps, and other lunch items along with crafted cocktails. The southern-facing beach is warmer than many in New England, though parents should keep in mind that the waves here can sometimes get intense. It's perfect for older kids who can grab a boogie board and bodysurf; families with young kids, however, may want to consider the more sheltered Carousel Beach in the center of Watch Hill. Conveniently, that beach is also right next door to the Flying Horses Carousel, the oldest carousel in the country, and a must-do attraction for young kids, who can ride antique horses and reach for the brass ring as they circle around. For days when you'd rather not deal with the sand, the hotel does have an indoor saltwater lap pool on the premises, with doors that open up onto a sunny verandah overlooking the ocean. The pool is somewhat small, however, and children are only allowed during the hours of noon and 3 p.m.
During the summer, children ages 5 to 10 can participate in the kids' program called Sand Castles. Morning and evening events are led by professional counselors. 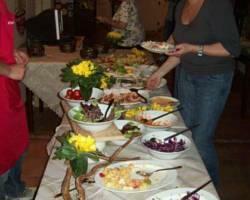 Scavenger hunts, hikes, arts and crafts and culinary education are some of the activities offered. Reservations are recommended for the program. Older kids also love hitting balls at the onsite putting green, where child-size clubs are provided. Whole families take part in games of croquet, which is a serious sport here. A significant portion of the lawn is reserved just for croquet, and daily croquet clinics are led by professionals. (Guests can also sign up for private lessons.) While there is no minimum age or dress code on the court, "croquet whites" (white polo shirt and white shorts or trousers) are encouraged to be worn. The hotel has transformed a 50-foot lobster boat into a family-friendly pleasure cruiser, which makes sunset harbor cruises and excursions to the quaint nearby village of Stonington, Conn., for a nominal fee. Tennis, golf, squash and complimentary bicycles are also available at the resort. Surf and paddleboard equipment and lessons are available at an additional cost. At a time when all restaurants are falling over themselves to tout their farm-to-table credentials, Ocean House rises to the top of the locavore food chain. That's because it includes on staff a dedicated "food forager," whose job is to specifically scour Southern New England to find the freshest seasonal cuisine. A full 80 percent of the ingredients served at the resort's signature restaurant -- appropriately named Seasons -- is sourced from within 150 miles of the hotel, including dayboat seafood from Watch Hill fishing boats, and honeycomb from the resort's own beehives. In addition, Ocean House maintains a off-property community garden specifically to source vegetables for the restaurant. It goes without saying that the menu is excellent, with preparations kept simple to bring out the natural flavors of the ingredients. The restaurant's decor is similarly understated but elegant. During dinner, jackets are requested for men and shorts and jeans are strictly verboten. Well-behaved kids, of course, are welcomed in the restaurant, and teens (or fans of the movie "Ratatouille") will particularly like the bar stools places directly on the counter of the restaurant's open kitchen, where you can literally have a range-side seat to the preparation of your own meal and ask the chefs questions as they cook. The vantage provides a wonderful dose of reality as you can contrast the sometimes-frenetic activity in the kitchen with the genteel atmosphere of the elegant formal dining room. Open in the summer, if the kids aren't quite ready for formal dining, the hotel also has seating around the outdoor verandah where it serves a stripped down version of the menu in a more casual atmosphere, as well as a separate The Bistro, featuring a zinc bar and red leather chairs, where a more meat-heavy grill menu is prepared. High chairs are available in all restaurants, and coloring books and crayons are provided on the verandah and in the The Bistro. For a hotel that prides itself on healthy, local cuisine, the children's menu in all venues is a bit disappointing, offering the same "basic five" meals available at most restaurants -- hot dog, hamburger, grilled cheese, mac n' cheese, and chicken fingers -- though steamed vegetables are offered as a healthier alternative to fries. 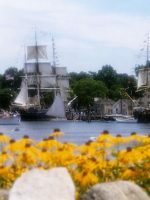 The one can't-miss culinary experience at the hotel is the weekly Rhode Island lobster boil and BBQ, which takes place on the beach one weekend night in the summer. Digging into lobsters, steamers, and stuffed clams while watching a bonfire and listening to a live band is a quintessential New England experience that guests and locals alike look forward to year-round. Kids are treated with a rubber ducky upon arrival (and an Ocean House onesie for infants) and can enjoy the complimentary use of boogie boards, paddleboards, and beach toys while they are at the beach. As a bonus, kids are treated to their own plush mini-bathrobes and items including bottle warmers, sippy cups, step stools and adjustable toilet seats are available upon request. Strollers, Pack 'N Plays, and cribs are free of charge to families that need them. Babysitters are available for an additional hourly fee. Adjoining the spa is a fitness center with a unique "Fitness on demand" system -- you merely type in the desired workout, and a giant screen comes down on one side of the room with a perky virtual instructor to lead you through your paces, whether that includes step aerobics, Pilates or the latest workout regimen du jour. All equipment is provided. Pets are welcome to stay here for an additional fee. The obvious time to visit Ocean House is during summer, when the days are hot, the ocean is warm and you can spend all of your time lounging on the beach or the verandah with an ocean breeze in your hair. The hotel, however, is open all year, and prices and crowds drop significantly in the off-season. 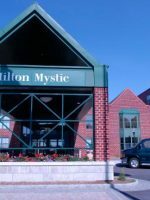 For many native New Englanders, the ideal time for a seaside vacation is "shoulder season" during May to early June or Labor Day to the end of October, when the weather is oftentimes still warm and sunny but the crowds are at a minimum (and when, at least in fall, the ocean is at its warmest). Wintertime holds its own austere beauty in the days when the ocean is at its greyest and angriest, and the roaring fire in the stone fireplace in the lobby makes a seaside escape particularly cozy. The lowest rates of the year are also enticing, suddenly bringing the ultimate in luxury lodgings close to, if not a bargain, then at least a significant value. Ocean House is located is the southwest corner of Rhode Island, just past the Connecticut border. Driving time is about two-and-a-half hours from New York and an hour-and-a-half from Boston. The closest metropolitan airport is in Providence, a 45-minutes drive away. Drivers should use the address "1 Bluff Avenue, Westerly, RI" for GPS systems. In addition, Westerly Airport, just four miles away, receives private planes and charters and offers flights to and from Block Island. Amtrak train service also serves the town of Westerly, a few miles away. The hotel can arrange transport to and from Westerly or other airports and train stations in the region. If you are driving your own vehicle, be aware that the resort has a somewhat chaotic valet system, especially on summer evenings when cars tend to back up in the semi-circular driveway as valets rush back and forth to the two parking lots across the street. Unfortunately, there is no self-parking option, which would speed the process up. Leave extra time if you are heading out in the evening, and give extra thought to combining trips to keep the need to access your vehicle to a minimum. The hotel also offers a convenient all-day shuttle into town for those times when it's a hassle to walk. 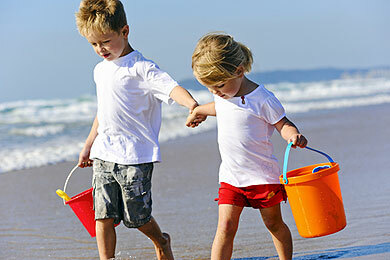 As fun as a seaside vacation with the kids can be, there are times when Mom and Dad just need to get away. 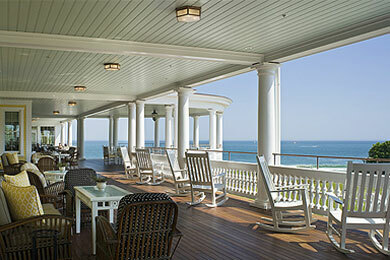 Ocean House provides the perfect opportunity for an escape-within-an-escape with its 12,000-square-foot OH! Spa (Ocean House, get it?) The spa is located in a new wing added to the "original" structure, full of windows with bright sunlight and ocean views. In keeping with the themes of the resort, ingredients used in treatments are changed seasonally, but always include sea salt, algae and other gifts from the sea. In addition to individual treatments, the spa also offers two- to four-hour top-to-tail "escapes," which include an onslaught of massage, facial, mani/pedi and other treatments; special packages cater to men, couples and pregnant mothers. The spa is certainly above average both in the relaxing physical environment and the sophistication of its treatment menu. It still has a few kinks to work out, however, before it can live up to billing as the top spa in the region, especially given higher-than-average prices. Spa services are available to teens 16 and over.